Cut Size (inches): 5/64" x 1/2"
Waste Bin Capacity: 6 gal. Waste Bin Capacity: 19 gal. Welcome to MyBinding video. So you have a small office and you’re looking for a paper shredder. Well we have a couple of ideas for you to think about as you shop around. Naturally one of first questions is size – what size office do you have? What size shredder can you accommodate? Some of them can be quite large, but then again if you buy one that’s too small, it might not quite meet your needs and become rather annoying. And logically, that brings up shred capacity, the most important factor. How many sheets at one time can this machine shred? There are a few factors that contribute to shred capacity, so you want to think about your office. How much will you actually be shredding? How much will you need? What is the capacity of the shredder you’re considering? The range can be large from a few sheets to a few hundred. Then there’s shred options. Chances are, you’re going to need your machine to do more than just paper. Do you want to worry about paperclips or staples in the process of shredding? Can it handle CDs, DVDs, credit cards and ID badges? Some things like that that you want to destroy and get rid off without worry. In your small office, you no doubt care about your personnel. Is the machine going to be safe enough for your workers? 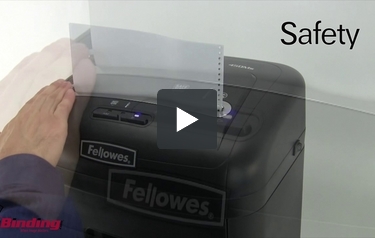 Some machines have great built in safety, like this Fellowes line with SafeSense technology. Once a hand gets near the opening, it just shuts down automatically. Check out the safety features on the machine that you’re considering. In the world of shredding, paper jams are inevitable. Most machines have some kind of anti-jam technology or reverse function. Just check yours out and see is it going to meet your needs. The term ‘small office’ can be a bit ambiguous when it comes to what kind of bin capacity you need for your shredder. Well it really depends on how much shredding you’ll be doing and how large of a capacity you need. And you’re the best judge on your own needs, and the range is huge from just a liter or two per bin all the way up to 50 to over 60 gallons per bin. Here at MyBinding.com we’ve created a video to help you understand all six levels of security when it comes to paper shredders. You need to find out which one you need to make the best purchase. Finally, you’ll need to consider oil needs. All paper shredders need to be oiled and in the small business, using it more often, you’re going to need to make sure it is well oiled. Oiling keeps performance up and protects your investment. Some higher end shredders are even self oiling. Check it out. Here at MyBinding we pride ourselves in customer service. If you have any questions at all, just give us a call. We can walk you through to find the right shredder for your business. For more demos, reviews and how-to’s, check out MyBinding.com.